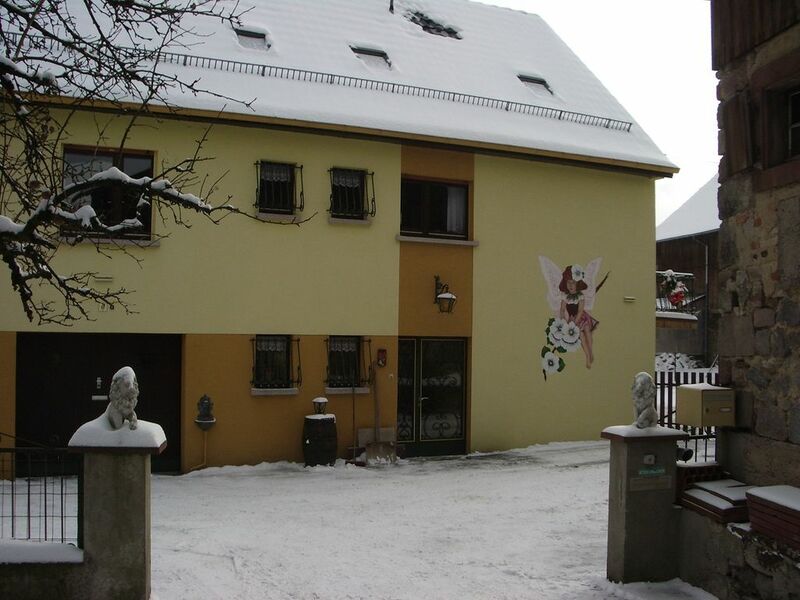 Rental 3 * designed for 3 to 4 people, 4th person on a folding bed (child) in Alsace in the Munster Valley, Stosswihr village located in the heart of the Vosges Natural Park and only a few km from Colmar, sinks towards the Hohneck and thus forms with the valley of Munster one of the most beautiful Vosges valleys. Alsace with its typical villages, its wine route, its route of ridges and farms inns with their marcaires menus, its markets of Noë by the variety and the resources of its landscapes. Stosswihr a few miles from the village of Eguisheim France preferred the French. Enclosed private parking, green area and barbecue on the edge of a trout river. Kitchen with all necessary utensils, stove, oven, microwave, fridge-freezer, coffee maker, blender, toaster, fondue, pressure cooker etc .. Living room with sofa bed, table, flat screen color TV, radio-cassettes, dvd player, library, documentation. Do not rent until the week during the school holidays. Great to deal with Anne Marie, the flat was very spacious and had everything you needed. Excellent internet. You can pay extra for bed sheets and cleaning on departure or do it yourself. The photos don’t do justice, a very nicely situated flat at the top of the house, 2 large bedrooms, we used it to Ski at Gerardmer a 38minute drive, nice pizza restaurant within 200 metres. Quiet with the rumble of a pretty stream nearby. 4 gas ring hob and oven, a big fridge and an assortment of DVDs. Because it was winter we really appreciated the warmth of the 23 degrees within the flat. I also enjoyed the morning ritual of watching the nearby chickens coming out of their hutch. Un grand merci d'avoir choisi notre location, merci également pour votre appréciation et d'avoir laissé le gîte en parfait état de propreté. Merci pour votre message amical, nous vous souhaitons une bonne continuation. Die Wohnung ist sauber und gut gelegen. Die Vermieter sind sehr sympathisch und hilfsbereit. Bäckerei und Restaurants sind im Ort. Von Stosswihr aus können schnell attraktive Wanderziele erreicht werden. Das war sicher nicht unser letzter Besuch in den Vogesen! Wir haben in dieser gemütlichen und geräumigen, sehr gepflegten Ferienwohnung einen sehr angenehmen Aufenthalt gehabt. Die Wohnung ist sauber und liebevoll eingerichtet. Geschirr usw. ist alles in sehr ausreichender Menge vorhanden, wir haben überhaupt nichts vermisst. Die Gastgeber sind wirklich nette und angenehme Leute, die uns einen herzlichen Empfang bereitet haben und bei denen wir uns wohl gefühlt haben. Die Wander- und Ausflugstipps haben wir gleich in die Tat umgesetzt. Die ganze Gegend ist ein herrliches Wanderparadies und nur zu empfehlen. Praktisch fanden wir es auch, das eine gute Bäckerei zu Fuß erreichbar war. Wir kommen bestimmt einmal wieder und bedanken uns nochmals für alles! Claude und Simone aus dem Schwarzwald! Wir freuen uns über jede positive Bewertung. Location impeccable, encore mieux que sur les photos. Propriétaires d'une grande gentillesse. Région magnifique. Nous recommandons vivement cette location à tous. Les enfants ont également adorés. Merci beaucoup pour l'accueil. Nous reviendrons chez vous, c'est sûr et certain. Encore merci et à bientôt. Nicole, Arnaud, Lucas et Logan " les Belges ". Nous remercions vivement cette famille très sympathique d'avoir choisi notre appartement et de l'avoir apprécié. Village located at the foot of the Vosges, to visit typical villages, wine route, route of the peaks with their farms inns and their menus marcaire, lakes, balloon of Alsace, war memorial War 1418, Strasbourg European Parliament, Mulhouse with its museums of automobile, railway, electropolys electricity, museum of Albert Schweitzer at 4 km, Colmar and the little Venice, the ecomuseum of Ungersheim, castle of Haut Koenigsbourg, adventure park at the white lake, climbing, horse riding, Gerardmer the other side of the slope of Alsace, La Bresse with its many ski slopes, many hiking, snowshoeing, cross-country skiing and downhill possible, Christmas market from late November to late December, Christmas trail in the village itself from late November with several animations. Offer: a weekend or stay for birthday, wedding, Valentine's Day, Christmas, Mother's Day, etc. Paiement: 30 % d'acompte et le solde au moment de la réception des clés plus une caution de 150 euros qui vous sera restituée au moment du départ. Le prix est de 280 à 310 euros. Week-end 130 € . Location de draps et taie d'oreiller 8€ le lit. Serviette éponge 2.00 € Vacances scolaires,de samedi 16 h à samedi 10 h et en dehors selon demande.